This is the Ultimate High Extreme Adventure! 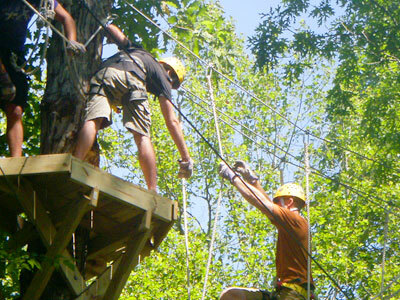 The Aerial Adventure Challenge Park (or Terminator Corner) at Historic Banning Mills offers 12 extreme challenge elements, up to 80 feet in height! Try the swinging planks, The Tarzan Slide, Loop to Loops and more, all without touching the ground. The Terminator Corner will keep your adrenaline pumping and heart pounding! The Terminator Corner is physically challenging, and safety is emphasized. This is an adventure for the brave at heart. 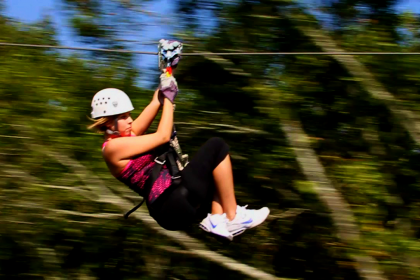 You can reserve the Terminator Corner by itself or as an add-on to our zip line canopy tours. Please allow an additional 1-2 hours added to your zip line canopy tour. The Aerial Adventure Challenge Park can be added to the Flight Pattern, the Pattern Plus or the Extreme Tours. The Terminator Corner is included in the All Day Rush and Two Day Rush packages! Terminator Course without zip line: $49.00 pp. Ten person minimum to open course by itself. PLEASE NOTE: Add on options can not be booked online. 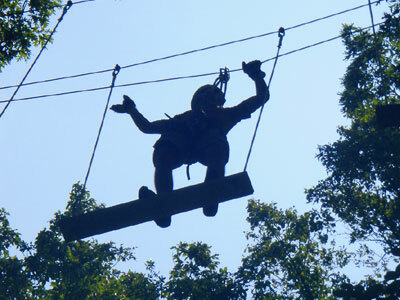 Please call 770 834 9149 to add to your Zip Line Canopy Tour Adventure.